Heat your frying pan over medium heat, with the coconut oil in it. Chop up your onion and fry it – you can caramelize your onion if you like by adding 1 tsp of sugar, but that’s optional. I added it because I am addicted to sugar and I have nobody around to curb my impulses. Once the onion is done – you can tell because it will have gone from white to translucent – put it aside and add the bacon to the pan. Fry ‘er up until crispy as you desire, then drain the bacon and put it aside as well. Get rid of the bacon grease and add the onion back in. Wash and chop the tomato; add it to the onion; wash the spinach and tear it up to add to the pan. Fry this for about a minute. While that’s going on, crack your eggs into a bowl, add the milk and whisk until combined. Add the egg combo to the veggies in the pan. 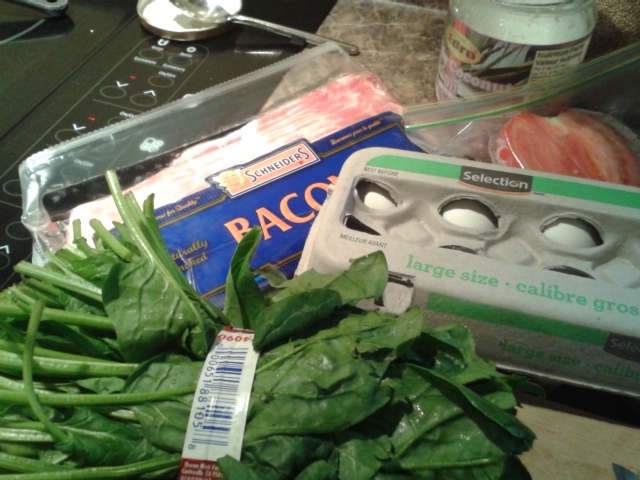 If you are a stronger person than I, cut up the bacon and sprinkle it over the top of the egg mixture in the pan. Reduce the heat to the low side of medium and cover; let it cook for at least four minutes – it will be done when the top I no longer liquid, but spongy. The caramelized onions are an amazing sweet-and-savoury component of this, and baking the omelette in the pan causes it to be light and fluffy and wholly different in texture than if I had simply flipped and fried it. 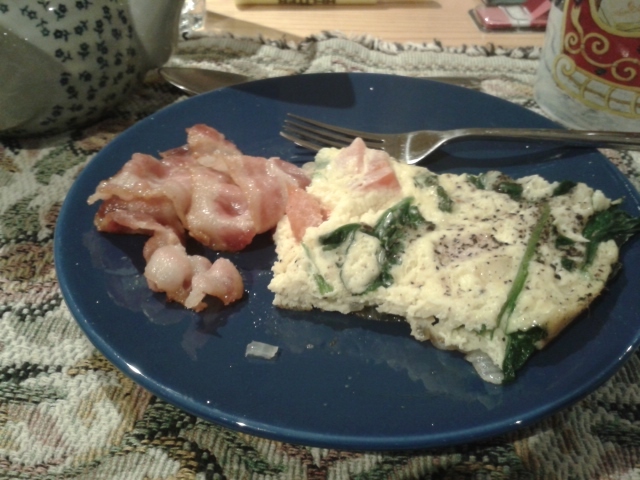 The tomatoes are still a bit juicy, and fried spinach is the best in omelettes. I was weak and ate the bacon on the side…first. Shh, pretend I am grown up and eat these sort of things concurrently. Bacon was on sale today at the grocery store when I swung by, and I couldn’t resist picking up a package (or two). In my heart of hearts, I disagree with factory farms and deeply mistrust packaged meat for all the chemicals and hormones it probably contains, but… bacon. On sale. When I am a student or otherwise underemployed, I fall back on a quasi-vegetarianism ruled by my wallet. I’ll only eat meat when it’s affordable – and that moniker exists on a sliding scale. Sometimes I’ll shell out $10 for a whole chicken, other times I’ll scream internally with disgust and nearly fling the $6 package of lunchmeat back into the fridge display. Forget organic or free-range or whatever. I’ll be ethical when I can afford it. Which is a shame, really, seeing as how the biggest farmer’s market in southern Ontario is just one town over. There are so many Mennonite/traditional German delicacies to be had, not the least of which being a truly amazing selection of wursts. Being Dutch, I appreciate a good wurst, though we call it worst, which I don’t hold against anyone, though it could be the base of several very good puns, of which I will spare you.